And the new regional mushroom guides keep coming. 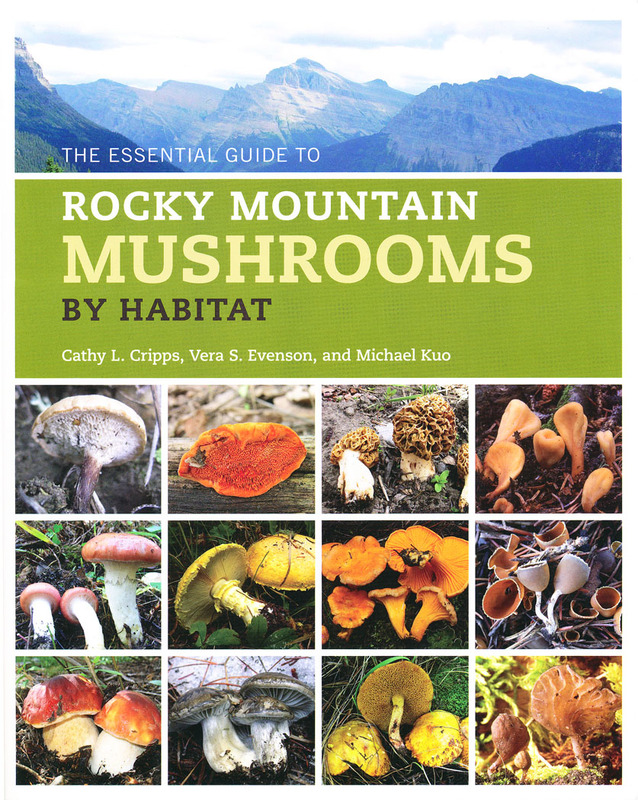 This attractive new guide to the mushrooms of the Rocky Mountains comes close on the heels of Vera Evenson’s Mushrooms of the Rocky Mountain Region: Colorado, New Mexico, Utah, Wyoming (“Evenson-II,” reviewed in the September-October 2015 issue of The Mycophile). However, it takes a different approach to presenting the mushrooms, namely an environmental one. The authors all are well known among amateur mushroom hunters. Cripps, a former student of Orson Miller’s, teaches at Montana State University and is known for her research on the fungi of aspen forests and high mountain habitats. Evenson is the curator of the Sam Mitchel Herbarium of Fungi at the Denver Botanic Gardens and a past president of the Colorado Mycological Society. Kuo teaches English at Eastern Illinois University and maintains the website, MushroomExpert.com. Both Cripps and Evenson have received NAMA’s Award for Contributions to Amateur Mycology. Larger than many field guides (about 8 × 12 inches), the book dispenses with much of the usual information geared to the beginning mushroom identifier. Thus, the Introduction is relatively short (only 11 pages). It includes a general description of the Rocky Mountains chain and its vegetation, pointing out how conveniently the latter is organized into a series of elevational zones, basic information on the ecological roles of fungi, how to determine spore color, and the authors’ suggestions for how to use the book. The latter involves a simple process—figure out in which habitat you found the mushrooms, go to that chapter of the book, look at the pictures, and read the descriptive information. Because only a limited sampling of the fungi that occur in the different habitats is presented, an alternative approach is provided for the frequent cases where your mushroom fails to match any of the species in that chapter. A simple key is included at the end of the species accounts that can be used to identify the mushroom (if it is one that is in the book) based on macromorphologic features. The species’ page-number references are given in the key, or one can go to a chart inside the front cover that shows, for each species, in which habitats it can be found. Essentially half of the species are listed as occurring in more than one habitat, with burned ground and alpine having the largest proportion of single-habitat species. The bulk of the book is devoted to the habitat descriptions and mushroom species accounts. Following that, it concludes with the key mentioned above, a page of cautionary information about edibility, over seven pages of references, and separate indexes for fungi, plants, and animals. As one would expect from the title, the mushroom accounts are organized by habitat-chapters. These, in turn, are organized within four general elevational zones and include: foothills (prairie [9 mushroom species], semi-arid shrublands , cottonwood riparian ), montane (ponderosa pine , Douglas-fir , aspen , and lodgepole pine  forests and burned ground ), subalpine (spruce-fir forests , snowbanks , and high-elevation pine forests ), and alpine (alpine ). Each habitat/chapter is introduced with five or six pages of information about the characteristic tree, other plant, and animal species, supported by lots of photos of both the habitat and species. Each species treatment includes a description of macroscopic features, geared to its morphologic type (gilled mushroom, bolete, puffball, etc.) and ecological occurrence, followed by a few sentences of observations. The latter typically include a common name, if there is one, familiar synonym(s), if there are any, edibility, mention of similar species, and so forth. All of the descriptive information and comments are fairly brief. Technical terms generally are avoided and microscopic features are included only rarely. Disappointingly, only 150 species are described and not many others are mentioned in comments with enough information to be useful. Thus, the book registers a total of only 5 species per dollar (in softcover; and only about 1.5 in hardcover). This compares with 7 spp/$ in Evenson-II, and both totals are low compared to other recent regional guides such as California Mushrooms: The Comprehensive Identification Guide (11 spp/$) and Mushrooms of the Pacific Northwest (nearly 17 spp/$). However, Cripps et al. chose their species wisely, as a large percentage of them do not appear in other guides. Just over half of them do not occur in Evenson-II and even if you own both of Evenson’s books (Evenson-I being Mushrooms of Colorado and the Southern Rocky Mountains), plus Mushrooms of the Pacific Northwest and Jack States’s Mushrooms and Truffles of the Southwest, there would still be nearly 50 species that appear only in the new guide. Coverage includes seven amanitas, seven tricholomas, six corts, six russulas, six suilluses, six hygrophoruses, five calvatias, and five lactariuses. Surprising was the lack of inocybes—not a single one, and Cripps is one of the world experts in the genus. I was immediately struck by the size of the mushroom species photos— they are very large (mostly 4.25 × 7 inches), occupying the upper half of each page. Their quality ranges from excellent to poor, with most being good and certainly usable for identification purposes. Quite a few are less sharp than they should be, perhaps having been printed from files that lacked sufficient resolution or because the camera was hand-held. Some exhibit limited depth of field, lack of focus on important points, poor color rendition, or unappealing compositions. The large size comes with an important trade-off. The use of so much space prevented the inclusion of more species. Halving the size of each photo would still yield a good-sized image and would have freed up enough space for perhaps another 75 species without increasing the page count. So, should you buy this book? Those with large mushroom libraries will doubtless want to add this one. It is attractive, authoritative, and well written. Determined mushroom identifiers who are more selective in their buying habits will need to weigh the limited number of species included and the lack of information on microscopic features versus the high percentage of species that aren’t in other books. For those who are just starting out and/or are without a guide for this region, this one provides fewer species for a slightly greater price than Evenson-II and so the latter would probably make a better first purchase, both for its somewhat greater coverage and its inclusion of more basic information for learning to identify mushrooms. I suspect that the inclusion of many pictures of trees, wildflowers, birds, and large creatures will especially appeal to general naturalist types and so the book could serve as a welcome present for that special hiker friend.